The Permanent Secretary (PS) for the Ministry of Energy and Energy Industries (MEEI) is responsible for the overall performance management of the organisation. In this regard, the PS provides support for evidence –based decisions and policy making to track the progress, outcomes and impact of government’s projects, programmes and policies, particularly as they relate to the achievement of the goals and objectives of the Government of the Republic of Trinidad and Tobago (GORTT). The core strategic areas of focus overseen by the PS are Government Performance, Sector Performance, Internal Process validation, and Human Resource Capabilities. The PS Secretariat under the direction of the MEEI’s PS assists with his/her daily responsibilities in leading and managing the portfolio of the MEEI. The Secretariat works in partnership with all divisions within the MEEI to form a cohesive team to achieve the strategic objectives, in alignment with the Ministry’s mandate. The PS Secretariat supports the management of the Office of the Permanent Secretary through application of efficient and effective process, programme and project management practices. The Secretariat recognizes the dynamic nature of the MEEI operations and as a result executes adaptable approaches to meet the organisational needs in a timely manner. The following highlights, some of the key operational activities executed by the PS Secretariat. Stakeholder relations including responding to client enquires and surveys to assess the Ministry’s effectiveness in treating with client requests. Management team relations including liaising with Heads of Sections to provide required support to ensure efficient delivery of the MEEI services. 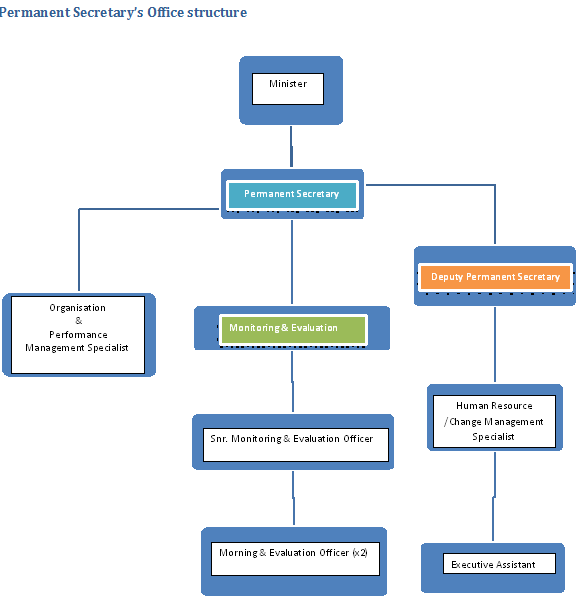 The Permanent Secretary’s Office structure will facilitate general overview of the Ministry’s performance and allow a more strategic focus on the Ministry’s deliverables, especially within the technical divisions, to provide relevant information to the Executive Office and allow for more timely interventions to be made.